Some of you right remember that we started over with our bees this season after a roller coaster of a year last summer. (See my post: Starting Over Again – Bees 2013). 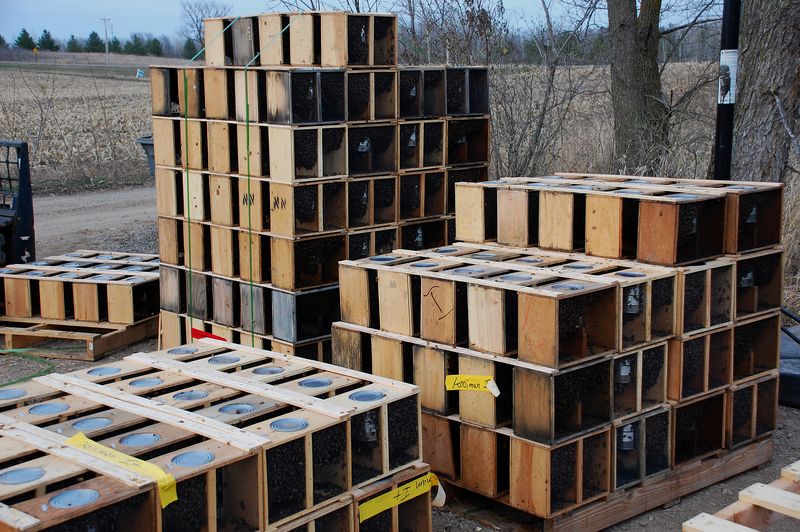 We purchased 2 nucs and installed several old brood frames that had pretty good honey and pollen stores from the previous year. With the honey and pollen already in the brood frames and the dandelions nearly starting to bloom, we decided that we could forego feeding the bees sugar syrup and pollen patties to get them off the ground. Unfortunately, we had a very long cold and wet spring that kept the bees inside the hive instead of out foraging and being productive. July was a good weather month but August was very hot and dry, which are also not very productive conditions for the bees. 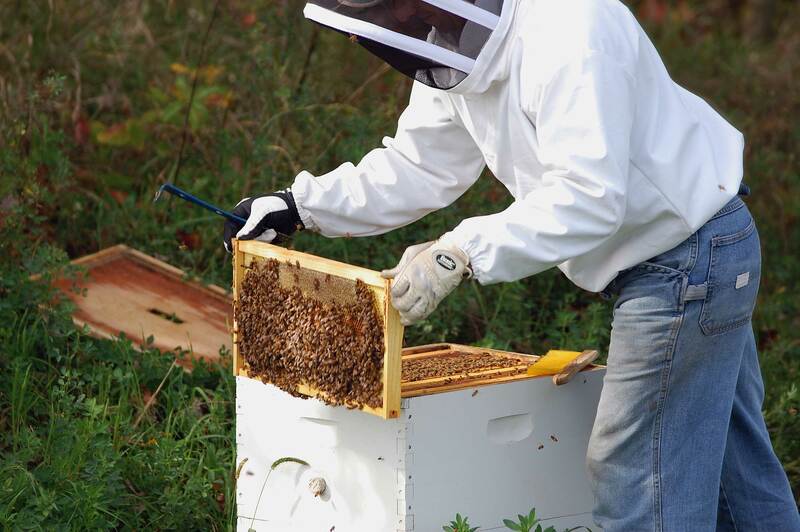 We have learned from past experiences that the hives have a higher chance of surviving our harsh Minnesota winter if we have them fill 3 deep brood boxes before adding honey supers. Both hives grew into their 3 brood boxes in June and were ready for their honey supers a couple of weeks before the basswood trees bloomed. One hive was a little more productive and filled 2 honey supers and the other filled only 1 honey super. 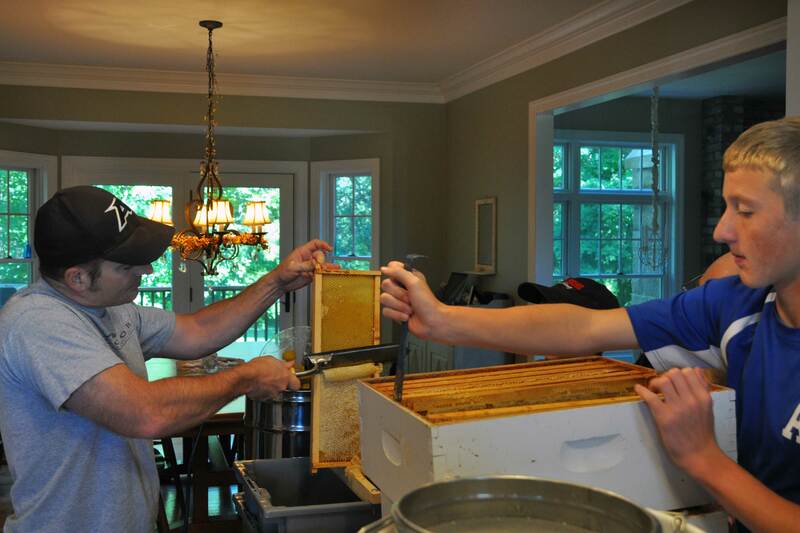 In past years, I have been frustrated with the difficulty of un-capping the frames when the honey supers were loaded with 10 frames, as not all the frames were drawn to a full depth that would allow for the cappings to extend beyond the frames. 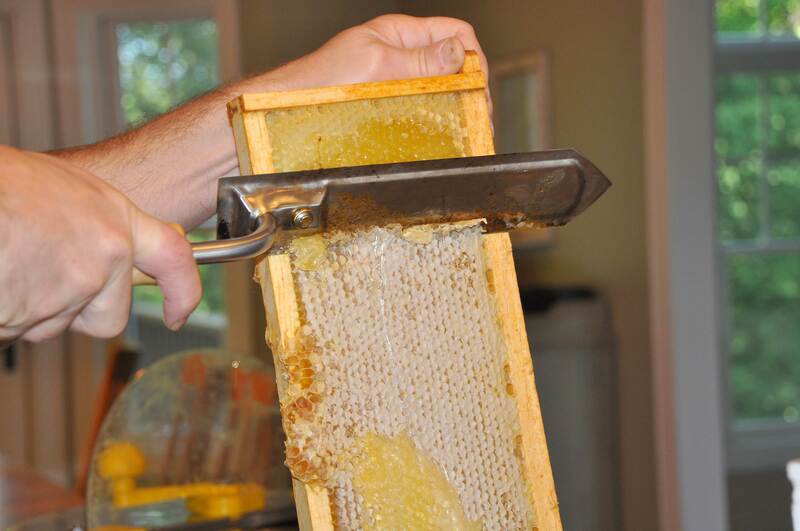 When this happens we have to use a manual capping scratcher that does not open the honey cells as well for spinning. It also damages the comb much more, which requires extra effort from the bees to repair the damage the following year. When the bees are drawing and fixing comb, they are not out foraging and collecting honey. So I decided to try using only 9 frames in each honey super so that there was more room to fully draw the comb past the frames. This approach worked quite nicely. See how easily the cappings are removed with the hot knife? This method does create more cappings, but leaving the cappings in the un-capping tubs for a couple of days was enough for them to drip clean and leave us with almost another gallon of honey. The extra cappings will also be useful in creating more candles. 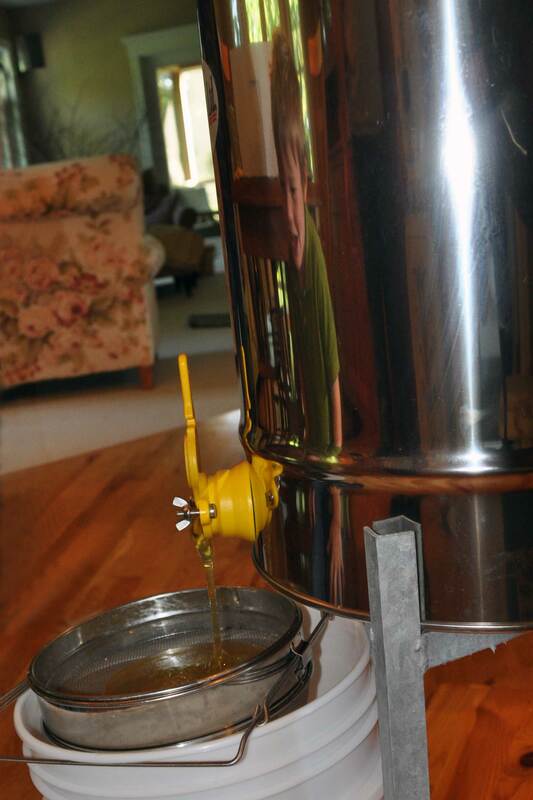 It is so much fun to watch the honey flow from the spinning tank and into the double strainer. Although the entire process can only be described as a sticky mess, it is well worth the efforts. The final results from the 3 honey supers was about 6 gallons of honey. Not a great year, but much better than last year for sure! 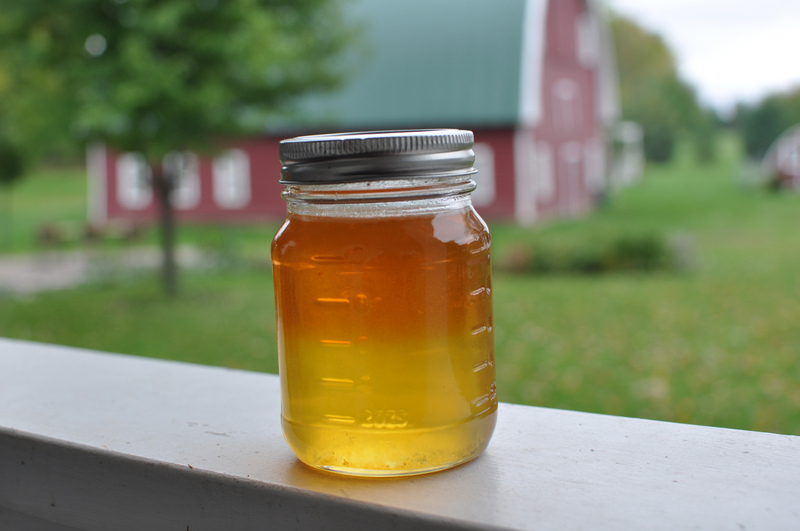 One thing that immediately caught our eye as we started to do the bottling process, was the very light color of the honey this year compared to earlier years. I would typically classify our honey as light amber (the jar on the right below was from last year) and this year I would have to say there is no amber color at all. I cannot conclusively say why the big change, but here are some possible factors. This is the first year that we had only Carniolian breed, previous years have been either both hives Italian breed or one of each breed. The long cold wet spring could have limited access to some plants, and additionally the hot dry late summer period could have also limited some plants. This spring we also plowed under a dwindling alfalfa field that was adjacent to the hives. I will consult my local beekeeping guru and see if he can share some thoughts on this as well. Below is a really strange jar that caught my attention. I had a half full jar of the previous year (darker) honey, and decided to scrape the last bit of new (lighter) honey into the same jar. Surprise, surprise…the next morning the light honey was on the bottom and they stayed separated! Obviously the new honey is more dense (less moisture) than the old honey, but why didn’t they just blend together?!?! For that, I do not have any ready answers. Maybe one of you chemistry-minded folks can educate us. We are in our second year of beekeeping and what a year it has been. Similar to gardening, the season started off with us full of hope about the potential bounty of honey we would enjoy come fall. As any gardener knows however, things rarely go as planned when you are dealing with the forces of nature. 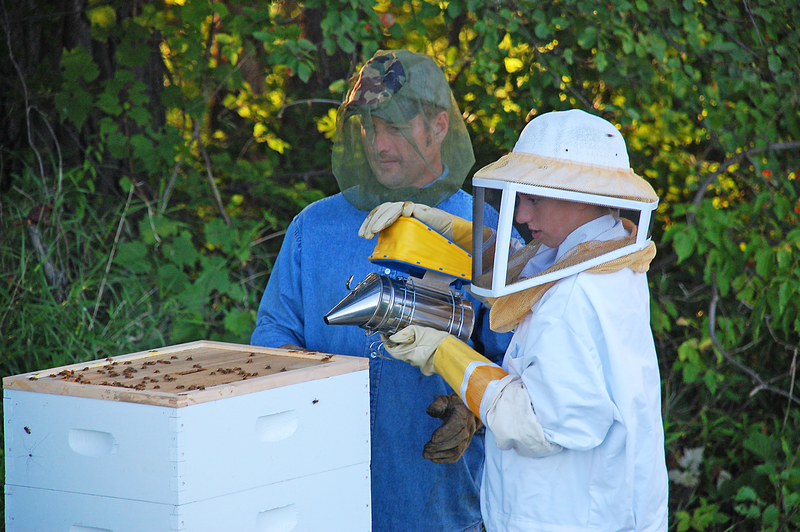 Earlier this spring, the boys successfully installed two packages of bees into the hives and we waited to see how the new bees would do. 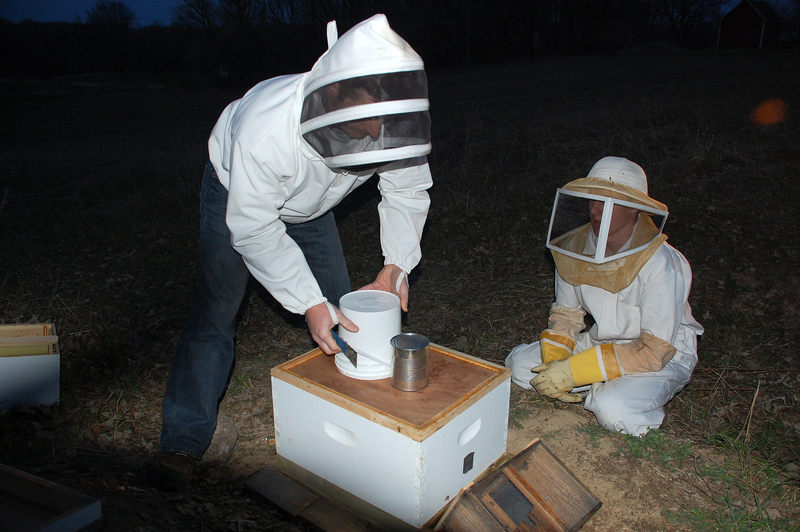 It was not long before we figured out that one of the hives was failing. The queen had not survived for some reason and no new brood was present. I installed a new queen to try to help them get established, but she also turned out to be an ineffective queen, mostly laying drones (the worthless males) instead of worker bees (the industrious females). Our last desperate attempt to save the hive was to get rid of that queen and place a frame with eggs from the functioning hive in the failing one in the hopes that the bees would make a new queen. Unfortunately, the bees were unsuccessful and the hive was a total loss. 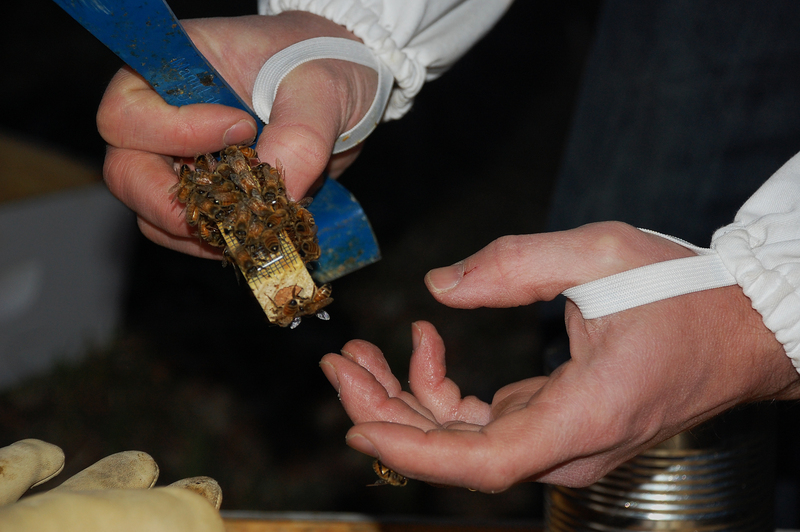 With one hive left, we crossed our fingers and hoped for the best. As the summer progressed, it was clear that the remaining hive was not doing as well as the bees did last year. Periods of cool weather and bouts of rain slowed their progress significantly. 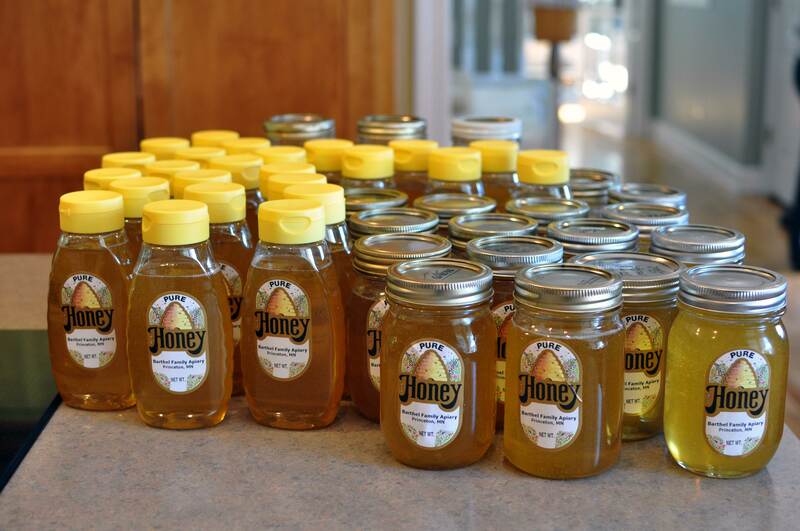 We finally got around to harvesting our honey for the year just recently. Jesse removed the frames from the honey supers one by one. The autumn joy sedum is in full bloom in the garden now, a sure sign of fall. On warm days, it is absolutely covered with honeybees. They love this plant. Because Jesse is always trying to figure out what the bees are up to, he started checking the sedum daily for bee activity. 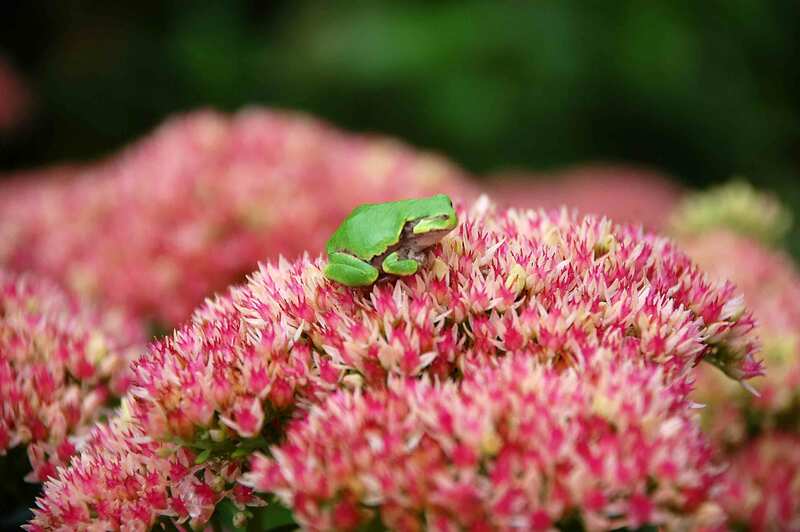 One day he found this little neon-green tree frog sitting on the sedum blossoms. What a strange spot for a tree frog to hang out. He grabbed the camera and took some pictures. As he was taking photos, a honeybee happened to come along to work the blossoms. He landed next to the tree frog. The little frog didn’t seem to care. He just continued to sit motionless on the flower. 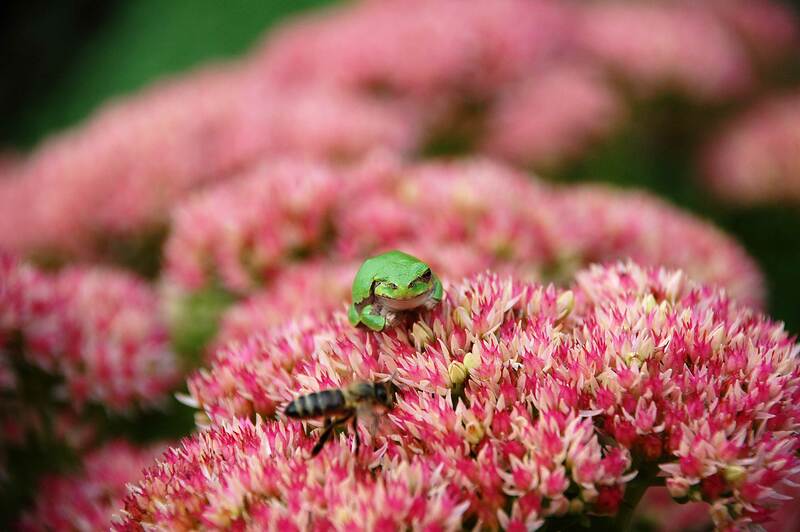 Sedum, tree frogs and honeybees. A strange combination, indeed. 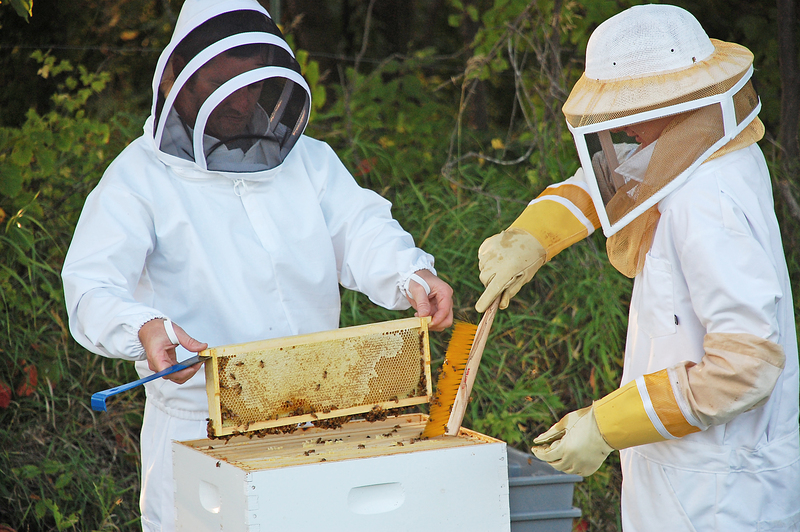 Our adventure as beginning beekeepers keeps providing us with new challenges and opportunities for learning. After getting our two packages of bees in early April, we soon discovered that the queen in one of the hives had not survived. 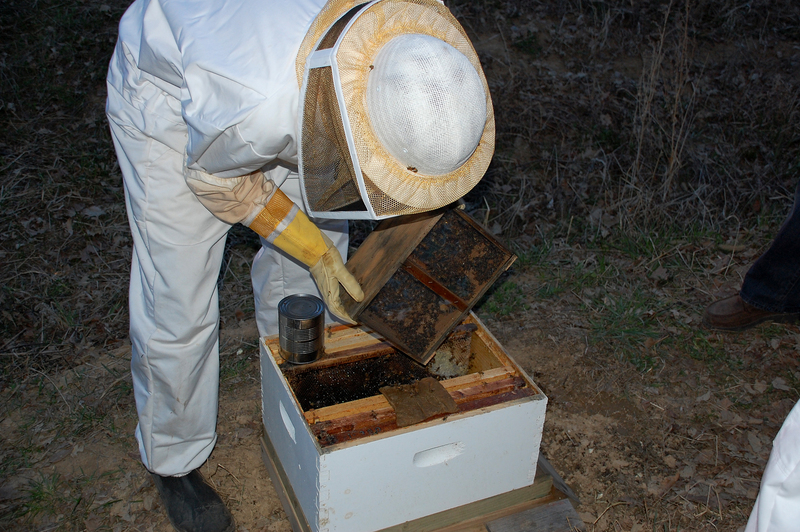 I picked up a new queen from our supplier and re-queened that hive (read about it here). Following his instructions, we did not open the hive to check on the how she was doing for a full two weeks. Excited to see how things were coming along, it was finally time to open the hive. Our package bees arrived last night after a long and harrowing trip from sunny Chico, California, to the cool weather of Minnesota. Their arrival was delayed a day after they were temporarily stranded in Wyoming due to a snow storm. Our bee supplier, who lives only about 15 minutes from our home, received 800 packages of bees from the truck carrying around 2,400 packages (about $100,000 worth of bees!). 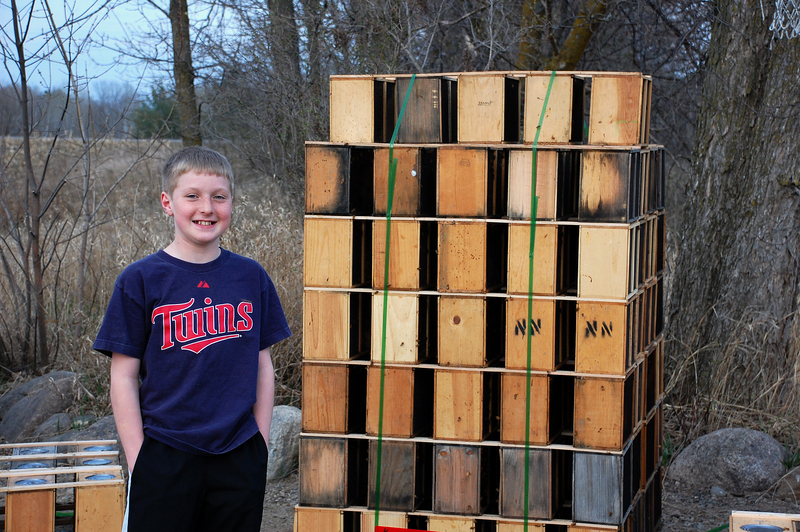 These are some of the pallets sitting in his yard when we arrived. Although most of the bees were inside the packages, there were several “hitch-hikers” flying around too. You can see some of them on top of the packages. 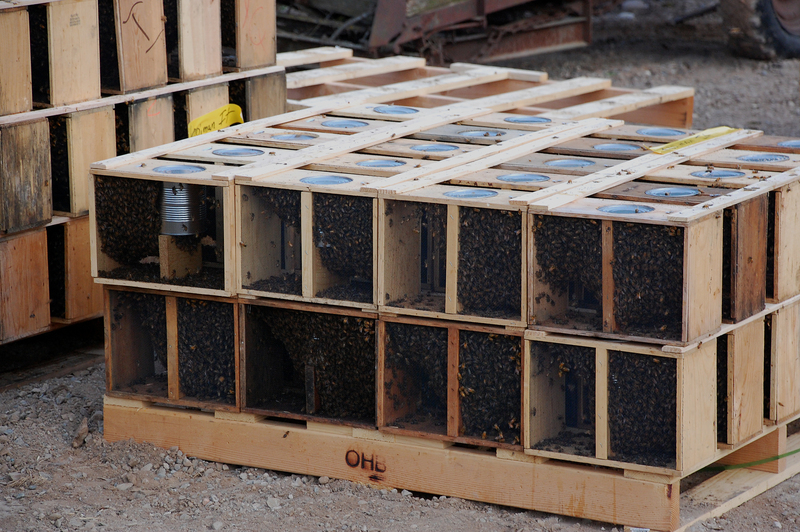 I was hesitant to approach the crates to take pictures, but the bee guy reassured me it was safe. 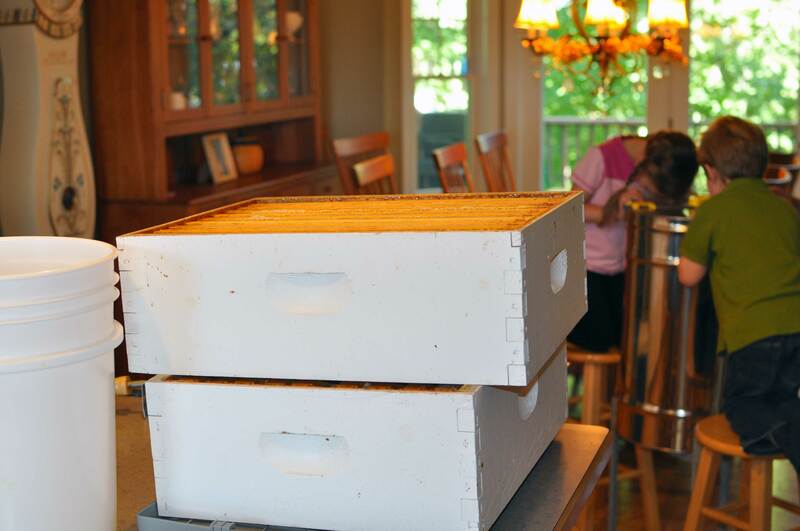 Once we got the bees home, it was time to install them in their new homes. Jesse sprayed them with sugar syrup to slow them down and make them easier to shake out of the package. He was not wearing any protective gear because we only have two bee suits and both of the boys wanted to help. After spraying them with the sugar-water, Jesse first removed the queen from the package. She is in a separate little cage inside the package. Her attendant bees stuck close to her. Time to shake the bees out of their package and into the hive. The bees explore their new digs and after shaking the majority of the bees out of the package, they released the queen down in hive. She was quickly surrounded by her attendant bees. Because it is early in the season and no pollen is yet available for the bees, we are providing them with some supplemental food in the form of pollen patties (on right). We are also feeding them a sugar syrup mixture to get them through the next few weeks until the first crops are available (usually dandelions). The feeding bucket has tiny holes that drips the liquid out when inverted on top of the top board. Notice that Jesse ended up having our youngest hand over the bee suit after being stung on the head! Turns out the bees were a little cranky after being banged around and dumped out of their package and into the hive. I would not be surprised if they were also a little upset about being relocated from warm and sunny California to Minnesota. That would make me crabby too. 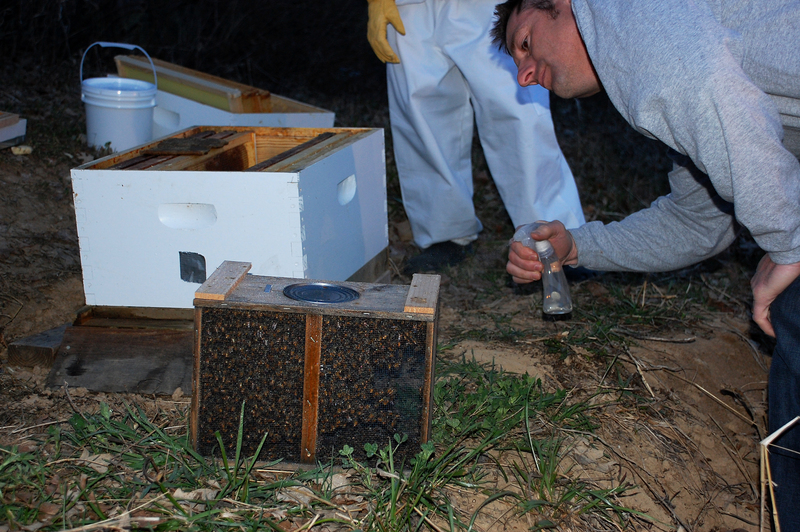 The installation of the second hive went a little smoother and by the time we finished it was almost completely dark. 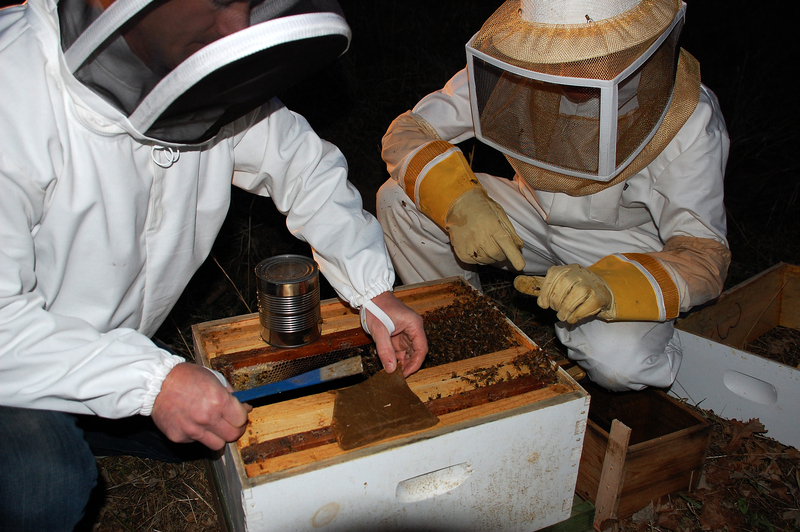 It is best to install the bees at night so that they can acclimate to the hive for several hours before the worker bees take off to forage. Here is the queen for our second hive. 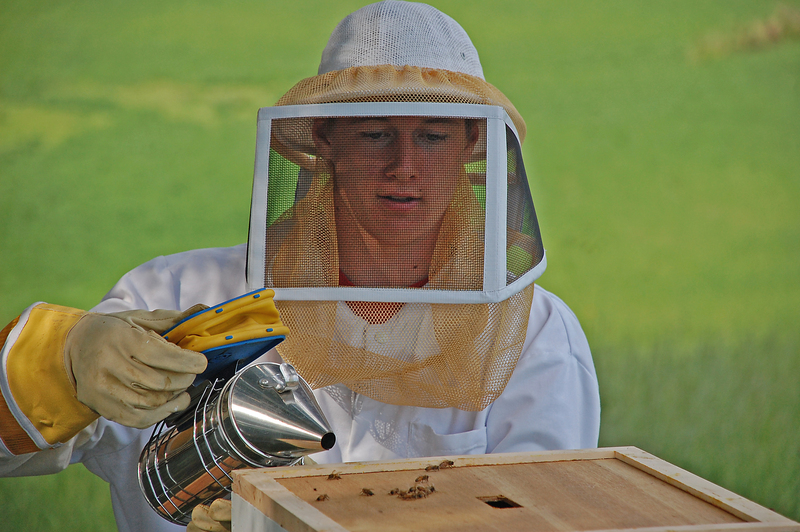 After putting the queen into the hive, Jesse carefully replaced the remaining frames being very careful not to squish the queen. The bees are now installed into their hives and ready to start their work today. 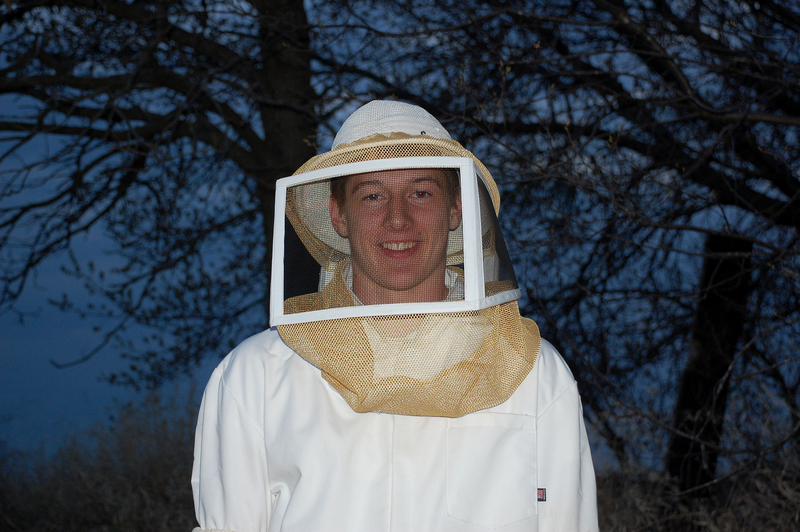 We are hopeful for a successful beekeeping season with healthy and productive bees! The kids thought their dad was a little weird when he told them we were getting bees last spring. This came as no surprise to us because what kid doesn’t think their parents are weird at some point? 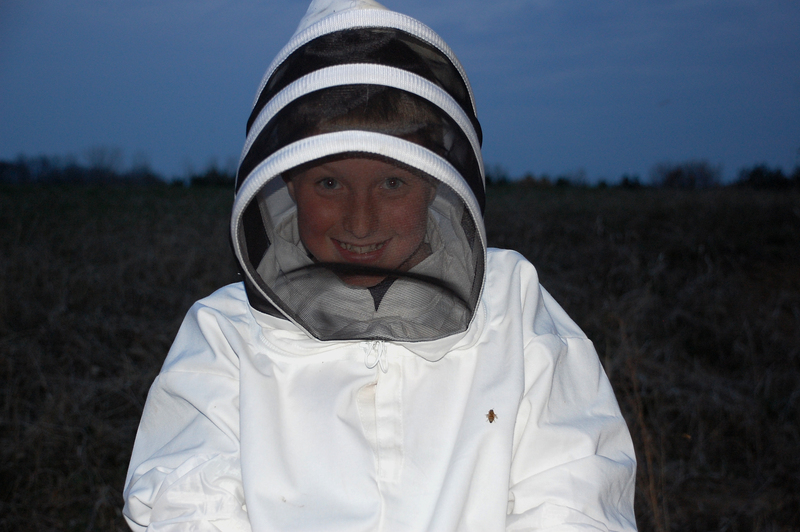 Jesse originally thought he would focus on getting our youngest son involved with the bees as a special project they could do together. 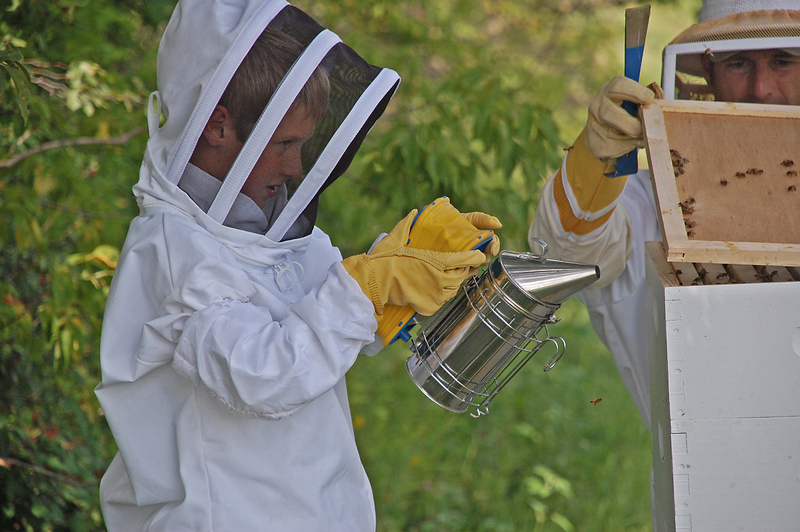 They checked on the hive together and Jesse shared with him all he was learning about bees through reading and talking with his bee mentor, Paul. As the summer progressed, however, an interesting thing happened. The other two also became interested in working with the bees. Eventually, each time Jesse would say he was going out to check on the bees a discussion would ensue about whose turn it was to accompany him. 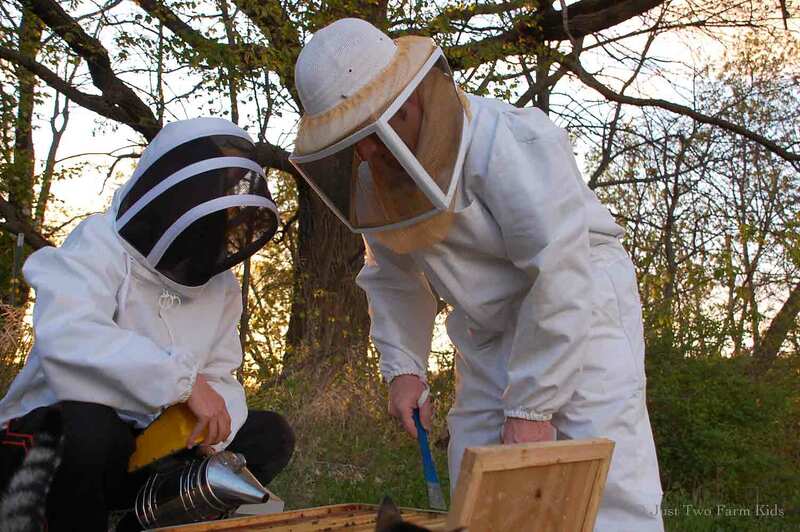 We purchased a second beekeeper suit and they each took turns working the bees with their dad. Smoking the bees encourages them to gorge on honey, which makes them calm. Calm bees are a good thing when you are pulling out frames to inspect. Our youngest takes his turn. 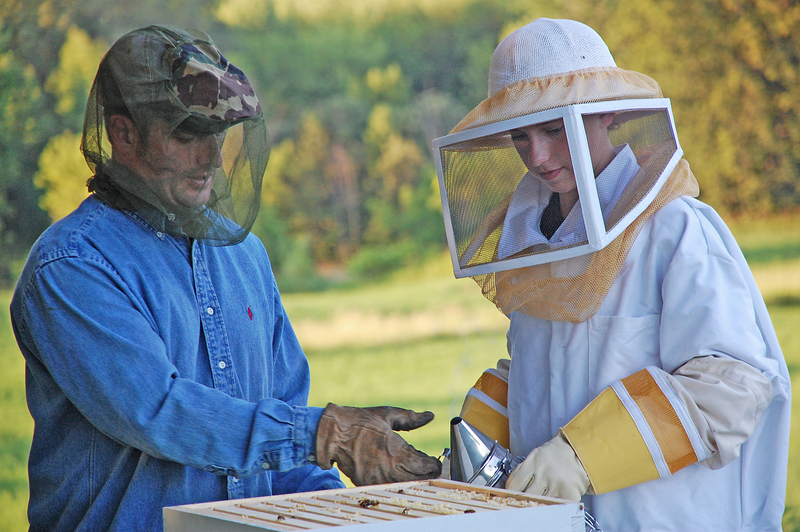 Even our oldest, a genuine teenager and huge XBox 360 fan, wanted a turn working the bees. We couldn’t have been happier. Brushing the bees off to get a better look at the frame. 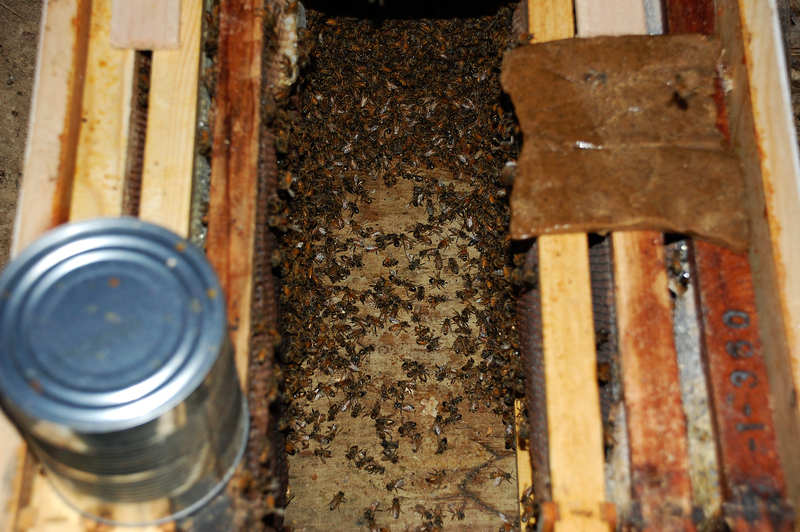 The bees are making good progress in capping the combs filled with honey. And so the bees have turned into a family project. These amazing little creatures have attracted the interest of our teenagers enough to lure them outside and away from technology. For that, we are grateful.